Adoniram Judson would remember that startling revelation for the rest of his life. With his strong academic training, keen intellect, and linguistic abilities, he might well have become a prominent theologian, scholar, or politician in 19th-century America. But his profound desire to do the will of God led him down a very different path. Born on August 9, 1788, in Malden, Massachusetts, Judson was a precocious youth. He learned to read at the age of 3, did especially well in reading and mathematics in the schools he attended, and even mastered Latin and Greek. His father, Adoniram Judson, Sr., whose theological strictness had led to a series of unsuccessful pastorates before he finally ended up at a conservative congregation in Plymouth, believed that his promising son would be safer at a nominally Baptist school than at liberal Harvard. So he sent young Adoniram to Rhode Island College (newly renamed Brown University) in 1804. The plan backfired: Adoniram graduated as class valedictorian three years later, but during his college years he had become a deist who no longer believed in the existence of a personal God or a Savior. After college Adoniram briefly ran a school in Plymouth, composed an English grammar and mathematics text, and went off to New York City where he eventually joined a troupe of itinerant actors. “I was then a wretched infidel,” he later said of these years. A turning point came one night while Judson was staying at an inn. In the adjoining room Adoniram could hear the groans of a man in the last throes of life. The next morning, Judson discovered that the man had died, and that it was none other than the college friend who had led him to reject his youthful faith. The prospect of what awaited this unrepentant friend after death shook Adoniram so much that he returned to his parents' home in Plymouth. The 20-year-old Judson, full of enthusiasm for life and a passion for excellence, decided to enroll in the newly-founded divinity school at Andover, north of Boston—but as a special student, not as a candidate for the ministry, because he had not yet made a profession of faith. He arrived at Andover Seminary in October 1808 and at once was engrossed in his studies. But he also reflected on his spiritual condition during long walks in the dense woods near the campus. Then, on December 8, 1808, he wrote in his journal: “This day I made a solemn dedication of my life to God.” At last he had found the Christ whom he had evaded for so long. Five months later, he formally confessed his faith and joined his father's Congregational church in Plymouth. 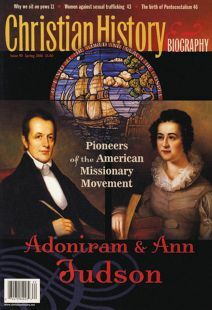 In a remarkable convergence of events that would have long-term consequences for the history of American missions, Adoniram's determination to become a missionary coincided with the beginning of several important friendships. He met a small group of Andover seminarians who, while students at Williams College several years earlier, had held a prayer meeting in the shelter of a haystack during a violent thunderstorm and pledged themselves to the cause of foreign missions. These young men, led by Samuel Mills, decided to form an association called the Brethren Society. Adoniram Judson soon became a member of their group. At least for Judson, another event of even more momentous significance occurred that weekend in Bradford. He met an attractive, well-educated, and deeply devout 20-year-old schoolteacher named Ann Hasseltine and fell madly in love with her. On the cold, blustery morning of February 19, with the Judsons and the Newells on board, a small, heavily-laden cargo ship called the Caravan eased out of Salem harbor to begin the four-month journey to Calcutta. Adoniram knew he would meet the pioneer English Baptist missionary William Carey when he arrived in India, and in fact he carried a letter of introduction. While at sea, therefore, he carefully studied the New Testament in an effort to understand the differences between the Congregationalists and Baptist views on baptism. Although his plan was to refute the Baptist teaching, the opposite happened: He became convinced that believers' baptism was correct. Though painfully aware that this would mean cutting ties with friends and supporters, Ann agreed. After the Judsons arrived in India, they decided to have Carey's associate William Ward baptize them by immersion. Luther Rice, who had had similar doubts, was immersed several months later. For the Judsons, the decision to become Baptists had enormous implications. They resigned from the Congregationalist American Board and found themselves in a foreign land with no home base of support. To make matters worse, neither the local authorities nor the British East India Company wanted Americans evangelizing Hindus in their area, and the small group of missionaries were forced to separate and seek out other fields of ministry. Through a set of circumstances they saw as “Providence opening the door,” the Judsons ended up on a boat to Rangoon, Burma. But for Ann the trip across the Bay of Bengal was to be the first of many tragedies: On shipboard she went into labor and lost her first child. On July 13, 1813, Judson finally arrived in the mysterious kingdom that he had read about as a student at Andover. Carey, who was highly regarded in America, urged the Baptists there to support the work. Meanwhile, Luther Rice, who had been in poor health, returned to the United States and energetically promoted the new Baptist mission. The result was the founding of the first Baptist mission board in May 1814: the General Missionary Convention of the Baptist Denomination in the United States of America for Foreign Missions. Commonly known later as the General or Triennial Convention because it met every three years, it appointed Adoniram Judson as its first missionary. For the new arrivals, existence in Rangoon—a hot, steamy, dirty city with no European society and untouched by Western influence—was extremely difficult. The community was firmly Buddhist and controlled by officials who had no understanding of religious diversity. Being gifted linguists, Ann and Adoniram quickly learned to speak Burmese, and Adoniram spent years studying the structure of the language. His ultimate goal was to translate the entire Bible into Burmese— this, he firmly believed, was his first priority as a missionary and the key to the conversion of a nation. Noting that the Burmese were a “reading people” with an extensive literature, he became more and more convinced that the written word was a vital evangelistic tool. In July 1816 he composed a manuscript about Burmese grammar and the text of his first tract, “A View of the Christian Religion.” The English Baptists in India supplied him with a press, and the American Baptist Board's first new appointee, missionary printer George H. Hough, arrived three months later. Judson completed the translation of the Gospel of Matthew in May 1817 and began compiling a full-fledged Burmese grammar—all while suffering from diseases and from grief over the death of a second child, seven-month-old Roger. More missionaries arrived in 1818, and the time was ripe to begin holding public worship. Just as Judson worked hard to translate Scripture into the language of the people, he also adapted his evangelistic style to the cultural surroundings. He erected a zayat—a small, open-air, hut-like building built on posts, located on a main road where interested passersby could sit on mats and listen to a Buddhist teacher, or in this case, a Baptist one. Every day Judson sat on the porch calling out, “Ho! Everyone that thirsteth for knowledge!” When he preached, said one listener, “It was impossible to escape the conviction that his whole soul was in his work.” Missionaries would repeatedly use zayats as a means of evangelism in the future. In June 1819, Judson baptized his first convert, Maung Nau, a 35-year-old laborer. By 1822 there were 18 converts. At the end of 1823, Adoniram set out on his next great venture: a mission to Ava, the capital of the Burmese empire and the site of the court of the powerful “Golden” Emperor. He hoped to influence the emperor to grant religious toleration, without which no real progress in Christian conversions could take place. The only reason they survived was because of Ann's tireless efforts. While pregnant with her third child, Maria, Ann brought food and clothing to the prison and bribed the guards to make life a little better for the prisoners. Again and again she went to Burmese government officials and the royal family, arguing the case for her husband's innocence and begging for his release. According to legend, she sneaked Adoniram's Bible translation into prison, hidden in a pillow, so that he could continue working. For two years missionary colleagues and American supporters heard no word from Ava and feared the worst for the Judsons. An easing of the worst conditions finally came when the Burmese government decided on peace negotiations with the advancing British forces, and Judson, because of his excellent linguistic skills, was needed as an interpreter. After the peace treaty had been signed, the Judsons were allowed to return to Rangoon and then to a nearby new settlement that the British named Amherst. During these difficult times the child was born, but the effect of these hardships proved too much for Ann, who died on October 24, 1826. Maria followed her mother in death six months later. But Adoniram's faith sustained him, and he threw himself into the tasks to which he believed God had called him. He worked feverishly on his translation of the Bible. The New Testament had now been printed, and he finished the Old Testament in early 1834. He also ordained the first Burmese pastor—Ko–Thah-a, one of the original converts—who refounded the church in Rangoon. During this period after the war, missionary reinforcements had arrived—most notably George Dana Boardman and his wife Sarah. Judson and the Boardmans had launched a new mission at Moulmein in southern Burma and in 1827 had established the first permanent church in Burma. Since Moulmein was the capital of those Burmese provinces now under British control and enjoyed full religious toleration, it became the center of Baptist missionary activities. Boardman mentored Judson's convert, Ko Tha Byu, a member of the animistic Karen people who inhabited the mountainous jungle area, and traveled with him on preaching missions. He also established a new station at Tavoy and began ministering among the Karens. The result was the growth of an indigenous Karen church, one of the great success stories of Burmese missions. George Boardman died of tuberculosis in February 1831, and three years later Adoniram married his widow, Sarah Hall Boardman. They were to have eleven happy years together. A loving wife and capable schoolteacher, Sarah bore him eight children, five of whom survived into adulthood. During these quiet family years, Judson revised his Burmese Bible and continued the mission work in Moulmein and in the Karen region, where he encouraged his converts to become missionaries to their own people. Meanwhile, additional workers came from America, and the mission expanded into other parts of Burma and even Thailand. In late 1844, Sarah's health began to fail, and the local physicians believed her only hope for survival was to return to America. Adoniram and three of their children traveled with her, but she died at St. Helena in the South Atlantic on September 1, 1845. Though grieving once again, Judson continued on to Boston, where he was welcomed six weeks later as a missionary hero. For 30 years the religious and secular press had recounted his exploits, and in the next weeks he was acclaimed from city to city. More enjoyable for him was returning to his old haunts in Massachusetts and renewing the acquaintance with Samuel Nott, the only other survivor of that group of seminary students who conceived the idea of American foreign missions. While visiting in Philadelphia that December, Adoniram met Emily Chubbock, who wrote popular fiction under the pen name of Fanny Forrester. His proposal that she write a biography of his late wife Sarah was followed soon after by a proposal of marriage—despite considerable controversy, since she was half his age and, as a fiction writer, she did not fit the saintly image that the public had bestowed upon Adoniram. Emily proved to be a delightful companion and devoted mother to her stepchildren as well as to their daughter Emily, born in 1847. Adoniram devoted the last years of his life to writing an English-Burmese dictionary. The Burmese-English half was halted, however, when he developed a serious lung infection and the doctor prescribed a sea voyage as a cure. It was to no avail; on April 12, 1850, he died on board the ship and was buried at sea in the Indian Ocean. He had spent 37 of his 61 years of life in service abroad, with only one home leave, and inspired countless young people to follow his example. Richard V. Pierard is professor of history at Gordon College in Wenham, Massachusetts. By bravely going where no American wife had gone before, Ann Hasseltine Judson inspired generations of women to become missionaries. Widowed twice, Adoniram Judson was blessed with not one but three extraordinary wives. Though Ann was the first and most famous, Sarah and Emily made significant contributions of their own. What was the exotic, distant land of Burma like? Ann Judson's memoirs gave 19th-century Americans a Provocative glimpse. Separation, seasickness, and study prepared early American missionaries for the ardors of the work ahead.